1. The Parents seeking Admission in either Class IV or Class VIII only need apply for admission in KV, Dharmapuri for the year 2018-19. 2. The parents belonging to the sponsoring agency (i.e. State Government of TN/ Undertaking of State Government of TN) However, can apply for Admission to any of the above mentioned classes, irrespective of vacancy position to be considered for admission under the special provisions of KVS Admission guidelines, under the sponsoring agency quota.Such parents must approach the vidyalaya for the Application/Registration form along with the service certificate in original,issued by the competent authority of the State Government of TN/ Undertaking of State Government of TN. 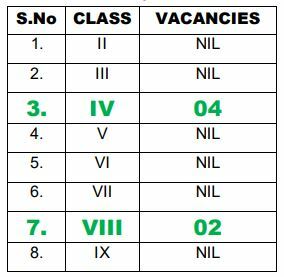 KV NTPC Anta : Vacancy Position for Hindi,Librarian and JSA.